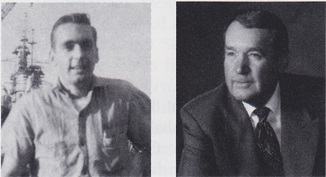 George J. Hefner, Electrician's Mate 3/c, born May 10, 1926, Sioux City, IA. Education: Univ. of Southern California, BS degree in business (1950). He joined the USN June 14, 1944, and was stationed at USNTC San Diego and in USS West Virginia. Memorable experiences include Battle of Surigao Strait, flag raising at Iwo Jima, suicide plane at Okinawa and first old battleship to enter Tokyo Bay. Discharged June 5, 1946, as EM3/c. His awards include the Asiatic-Pacific w/4 stars, American Area Campaign, WWII Victory Medal and the Philippine Liberation w/2 stars. Married Jeanne "Tiger" on Sept. 16, 1950, and they have six children and 10 grandchildren. He is senior vice-president of Paine Webber, Investment Securities. Hobbies are golfing and all sporting events.